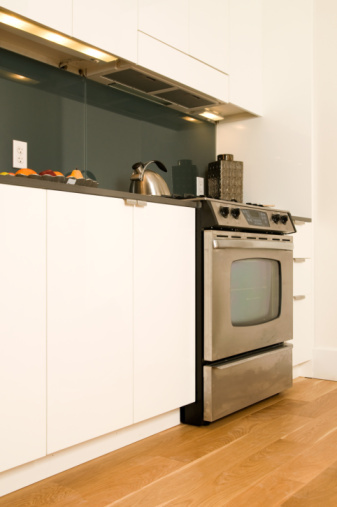 Some types of white painted cabinets may yellow over time due to grease or oil that has built up on the surface. You can remedy this by using household supplies to brighten the cabinets and remove the yellow stains. Avoid yellowing by cleaning the cabinets often to remove small amounts of buildup. Mix 1 cup bleach with 1 gallon of warm water. Add several drops of liquid dish soap and mix to combine. Use dish soap that contains a grease-cutting agent. Place paper towels beneath the cabinets to catch drops of cleaning solution. Dip a sponge into the mixture and apply it to the yellowed cabinets. Let it soak on the cabinets for several minutes. This will loosen the stains and make them easier to remove. Gently scrub the cabinets with a medium-bristled brush or a piece of superfine steel wool. Both of these scrubbing tools are tough enough to remove yellowing stains but gentle enough to not scratch the paint on the cabinets. Nevertheless, do not apply too much pressure. 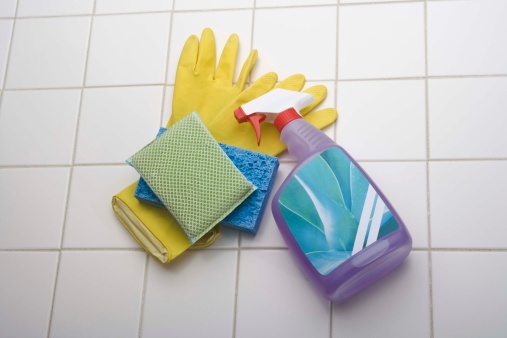 Reapply the bleach and soap solution as needed to keep the cabinets wet while you scrub them. Keeping them wet will help prevent the paint from scratching off. Wipe down the cabinets with a sponge. Mist the cabinets with clear water from a spray bottle. This will rinse away the bleach solution. Dry them thoroughly with paper towels.